Why not work for an INDUSTRY LEADER? POOLCORP is the world’s leading distributor of outdoor living products. We operate in more than 350 Sales Centers with nearly 3,500 employees who proudly service the needs of our customers. Our company strives to employ only the best CDL and Delivery Drivers, Warehouse Associates and Inside Sales Representatives as well as Sales Center Managers and Operations Managers. Because it is a place where you can grow! At POOLCORP you’ll find plenty of excellent career advancement and training opportunities to support your career growth. And, our generous compensation and benefits package includes medical, dental, vision, prescription coverage, 401 (k), EAP, and discounts specifically offered to POOL employees. During busy seasons, we also offer performance bonuses. And finally, our family-oriented, hometown culture is supported by a stable, large corporate enterprise – giving you the best of all worlds. So, end your job search here – at POOLCORP – Where Outdoor Living Comes to Life! The Warehouse Associate will increase operational efficiency, company profitability and customer satisfaction by accurately and safely receiving and storing materials, as well as picking, packing and scanning orders for pickup and delivery. Accurately pulls, fills, packs and sets up orders for delivery or pickup. Organizes shipment priorities, such as UPS, commercial carrier, daily, job site and will call and stages the orders in uniform fashion for ease of loading and verification. Assists in loading the delivery truck. Receives shipments, logs into inventory, maintains inventory through audits. Locates manufacturer’s packing list, verifies receipt of each item listed, signs and attaches packing list to each bill of lading. Signs and dates freight bill noting all adjustments and/or damage to product and reports any quality or inventory discrepancy issues to the appropriate person. Communicates positively with supervisors, sales staff, fellow workers and customers to coordinate deliveries/pick-up. Moves all inventory into allocated spaces within warehouse. Operates a forklift safely and efficiently, maintains required certification, performs vehicle safety checks and reports discrepancies to supervisor. Assists in keeping facility clean, neat, safe and operating efficiently. Attends product knowledge meetings as required by management. Assists in keeping facility secure. Ensures all equipment is stored at end of day and all doors and gates are secured. Maintains proficiency in computerized systems and other technologies as required. 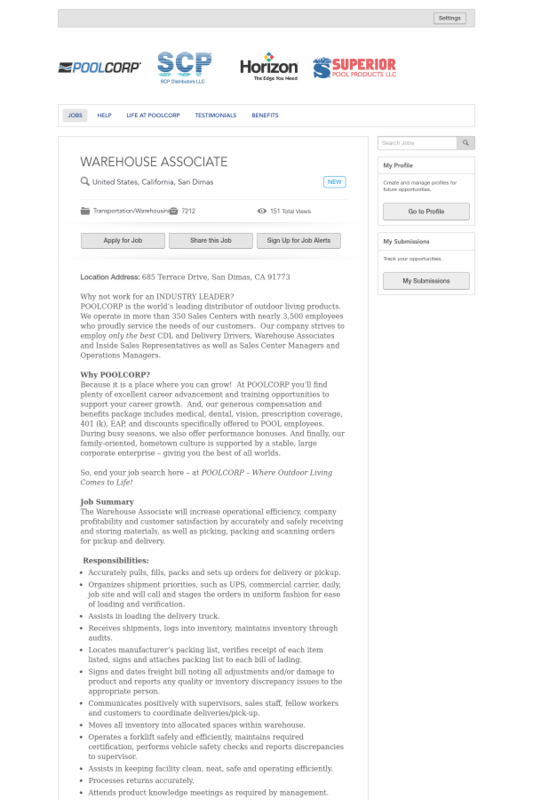 Prior experience in distribution or warehousing preferred. Ability to maneuver heavy objects, some weighing up to 100 pounds. Follow and carry out instructions with minimal supervision. POOLCORP is a drug-free company and an EOE, M/F/V/D.